How do brands continue to capitalise on demand for protein-rich foods while still captivating consumer attention? Here are some examples out of Europe…. For fit and active consumers looking for a protein fix, there are now a range of high-in-protein foods that offer an alternative to the obvious protein shake. Protein snack bars are commonplace, and traditionally beef jerky has found favour as a post-workout snack. But with excitement slowly draining away from the dried meats category, how do brands continue to capitalise on demand for protein-rich foods while still captivating consumer attention? A number of brands have begun to experiment with so-called ‘protein balls’ – convenient, bite-sized snacks that are high in protein and often feature seeds and nuts as well. The volume of innovation suggests that we might be seeing the next big trend, so here’s a look at four brands trying to introduce consumers to this nascent category. In March, Dutch food company Wessanen launched a new range of ‘power balls’ (above) designed to energise and fuel consumers through a busy day or active workout. The product has received an endorsement from the British Triathlon Federation and, launching as part of Wessanen’s Whole Earth brand, will target fitness fans and athletes at dedicated events throughout the year. Rich in protein, the power balls also contain superfood ingredients and are available in four different flavours: classic peanut butter; coconut; goji and red berries; and pumpkin, chia and flax seeds. Speaking about demand for the product, Whole Earth senior brand manager Katrina Farmer said: “As a brand we are dedicated to fuelling active lifestyles and are driven by the needs of our consumers – health-conscious people who make careful decisions about what they put into their bodies. At IFE 2017 in March, The Protein Ball Co exhibited its range of individually packaged protein balls. Made using one of three different types of protein – whey, egg white, and a vegan blend of organic pea and brown rice protein – the power snacks are available in six interesting flavour combinations including coconut and macadamia, cherry and almond, lemon and pistachio, and cacao and orange. The Protein Ball Co was launched after founders Matt and Hayley Hunt struggled to find clean and healthy protein snacks for on-the-go consumption. “When people think protein, they think bodybuilders and meal replacements. We wanted to change that perception and make protein accessible to people who have been to the gym, yoga or cross-fit or [people who are] looking for healthy snacks or just want to add more protein to their day,” they said. Clearly, on top of the nutritional requirement, there is an expectation that manufacturers use sophisticated flavour combinations and natural ingredients to forge a premium position for their products, which is then reinforced on pack with the use of unique visual imagery. Clean-label is important here, too. Boostball makes a range of protein balls with rustic and pared back packaging inspired by the brown paper bags favoured by independent retailers. The ingredients list is simple as well: just seven ingredients in each product, including dates, raisins, cashews and whey isolate. Wessanen has shown the potential for brands that are already present in the protein or health foods space to muscle in on the protein ball opportunity. But many of the companies active in the segment are smaller independent brands, often with no other product ranges. It’s a sign of how much of an emerging category it is. Bounce makes a dozen flavours of protein ball – including new V Life protein balls, which are made with 9g of vegetable protein, that draw on superfood combinations not seen anywhere else in the category. They include almond-kale, beetroot-cashew and coconut-cumin. Their standard range of protein balls includes variants like coconut-lemon, peanut, apple and cinnamon, and cacao-mint. It’s not just protein balls that are growing in popularity – there’s protein cubes too. 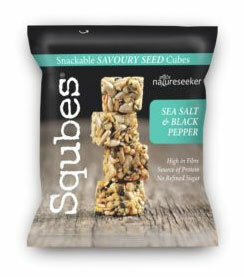 Squbes is a new range of snacks that, ironically, given their shape, offer more rounded nutrition thanks to the inclusion of seeds and nuts. There are two varieties: spiced sesame and almond, and sea salt and black pepper. The range, from Virginia Health Food, delivers only 167kcal per 30g pack and are high in fibre as well as being a source of protein and magnesium.